We are delighted to stock the excellent KINGTOP Waterproof USB Rechargeable LED Zoomable Head Light Torch Lamp with Internal Lithium Battery. With so many available recently, it is good to have a name you can recognise. The KINGTOP Waterproof USB Rechargeable LED Zoomable Head Light Torch Lamp with Internal Lithium Battery is certainly that and will be a superb buy. For this great price, the KINGTOP Waterproof USB Rechargeable LED Zoomable Head Light Torch Lamp with Internal Lithium Battery comes widely recommended and is always a regular choice amongst lots of people. KINGTOP have provided some nice touches and this equals great value. This ultra bright headlight switch modes -low/high/strobe through single button control. 90 degree adjustable up and down and will stay steady after positioning, allow you to focus light as needed. Flexblely adjust the spot size in order to suit for different width of the path and range of light. Perfect for camping, hiking, fishing, riding, running, walking and other outdoor sports at night. Built-in 3000mAH rechargeable battery; Has CE and RoHS safety certified; Working time up to 9h; No need to pay more money to buy the heavy 18650/AAA batteries. Powered via USB cable with PC, Laptop, Power Bank, AC Adapter etc. 5 LEDs battery display on the battery housing, 5-led/4-led/3-led/2-led/1 led green: 100%/80%/60%/40%/20%, allow you know the battery status better. Once the battery power is less than 30%, the red warning light will start flashing, it's time to charge the battery. Otherwise the light will automatically switch the brightness mode to a low mode, which will work for 30 min. Red warning light at the back, ideal for dog walkers, cyclists etc. who might want to have good night time visibility from behind. Easily adjustable elastic headband to fit any size of head at any age. LED casing and battery housing fully sealed against water entry. Super Bright: 1800 Lumens front lamp with CREE XM-L T6 LED, provides excellent brightness for any nighttime activity. 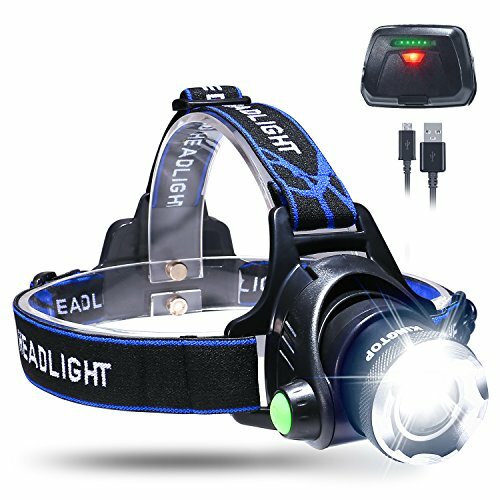 90° Rotation: 90° adjustable headlamp with elastic headband and lightweight battery box can be easily carried on the head. Can be also used as waist lamp. Zoom Technology: Flexblely adjust the spot size in order to suit for different width of the path and range of light. Max to 200M irradiation distance. Humanized LED Indicators: The battery indicator allows you know the battery condition better, and the low battery power warning light reminder you to recharge the battery, moreover the red warning light makes you more safer when night riding or wingk the dog. Indoor & Outdoor Use: Ideal headlamp for adults & kids - running, walking, fishing, hunting, hiking, cycling, reading, caving, DIY projects, auto repair & emergency kit. Comes with Headlamp, USB Cable, User Manual. Perfect gift for family & friends, order 2 and give one to your family or friend!